Olinda Ferny Creek Junior Football Club coaches, Carolyn Rose, Karina Gowan, and Linda Jewell with the under 12''s girls team. 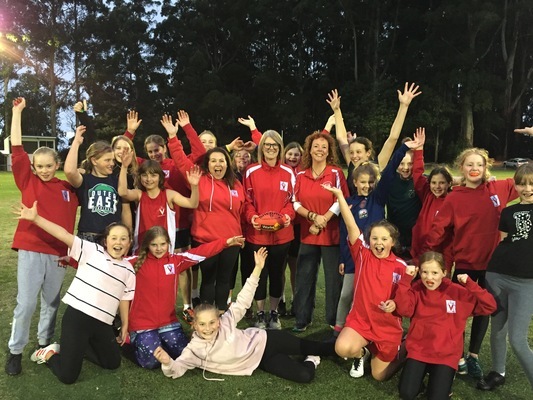 When Olinda Ferny Creek Junior Football Club fielded a girl’s football team four years ago, no one expected it to grow to three full teams and over 60 registered members. Recently, the club has not only shown that it is committed to junior girls football but also to building a new generation of women coaches to inspire and mentor them. Olinda Ferny Creek Junior Football Club (OFCHFC) President Patrick Ford said the club recently made the decision to have three women coaching the junior girls’ teams, following the popularity of female football. With the success of the AFLW, it’s been clear that the push for women’s and girl’s football at a grassroots level – particularly in the Dandenong Ranges – has been significant. Karina Gowan currently coaches the Under-12’s team and although has no prior experience in coaching said she was relishing the opportunity. “I think it’s really important to have female role models and that’s what the club was going for,” she said. “It demonstrates to the girls you can go out of your comfort zone and that it’s good to do so … I’ve played netball and am used to competitive sport but I really went outside my comfort zone to take on this position. President Patrick Ford said he expected the growth in women’s football to continue. “I think you’ll find the growth has been continual and there certainly no sign of it sopping particular when the clubs start looking at introducing senior teams,” he said. Olinda Ferny Creek Junior Football Club currently has three junior girls’ teams, – under 12’s, ’14’s and 16’s.